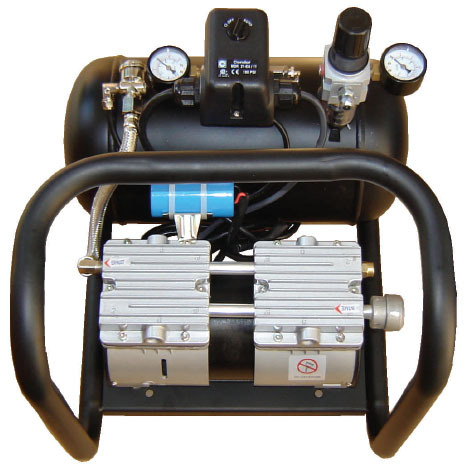 Dimensions: 16.5" x 13" x 16"
Despite the fact that oil-lubricated air compressors offer a number of benefits there are applications like food processing when an oilless air compressor is a must. For this reason, Silentaire Technologies produces a whole line of oil-free compressors that are able to cope with tasks where oil-lubricated units are useless. But the Silentaire AMP 50-8-TC Compressor, like any other compressor from this company, stands out by its exceptional performance, quality, and very quiet operation. As seen above, Silentaire compressors from the Oil-Free line are the perfect choice for those requiring silent and clean air systems. Moreover, all air compressors from the AMP series come at the most affordable prices among oilless compressors. To top it off, the Silentaire AMP 50-8-TC Compressor comes with the 1-year manufacturer's warranty. The warranty coverage includes free repair and replacements of parts if the manufacturer finds them defective. However, bad usage or tampering will automatically void the guarantee. But if used and maintained properly, the compressor will provide you with years of trouble-free operation. 18" x 17" x 15"